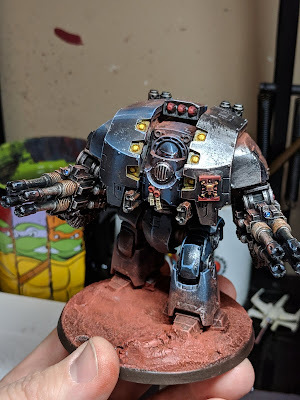 This week I made some solid progress on the Dreadnought army, thanks to a snow day at work and a decent amount of free time. I also was able to get the display board laid out and prepped for next steps. Before getting started on anything else I was able to finish off the Leviathan for the time being. I still need to paint the rest of his arm options, but that'll be for later. I love how he turned out, but I realized later that I forgot to put the green glaze on the armor plating. I also forgot to give him a chapter icon for his original chapter. I'm feeling like a nice Imperial Fists icon would look nice on the upper right hand side of his chest armor. I'll probably get that knocked out tonight, before I start on the next dreadnought. 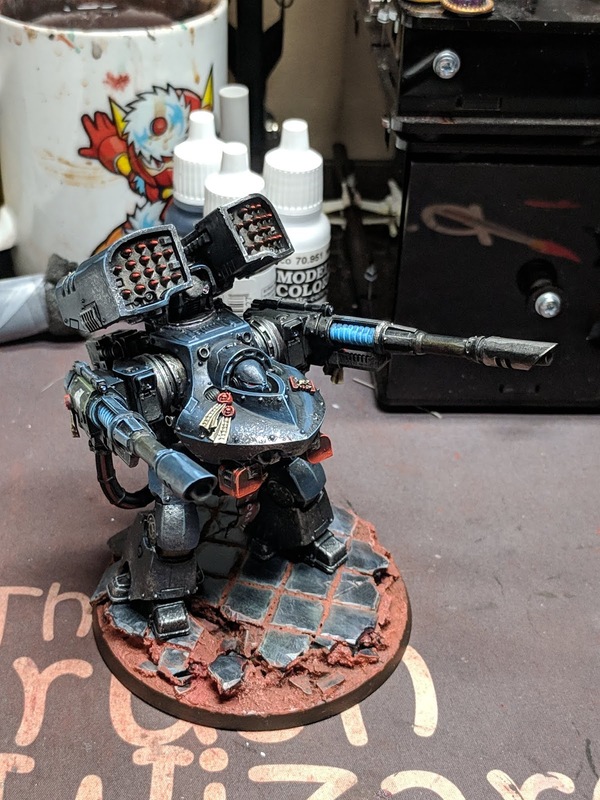 Originally purchased from my buddy Greg at last year's Adepticon, I've been anxiously awaiting painting him. Greg's former army, who this fella was a leader of, was a Black Templars army. So in true Deathwatch fashion, he carries the insignia of his former chapter with him. He was originally on a larger base, which I did some modifications to earlier. After working on the display board on Monday I decided to put him on a different base. Mainly because I couldn't get the original base to jive with the display board. Also, while he is a character and can't be targeted unless he's the closest model, the larger base did raise his height a bit and made it harder to hide him behind terrain if needed. One of my favorite dreadnoughts is the Deredeo, so it is kinda surprising that it was the last one I ended up getting. I know it gets a lot of flak for it's body style, but I feel like that make it an even more interesting model. It's not boxy or bulky, it's sleek. Originally I didn't order him with the missile pod. I had held off on it, because of the way points were shaking out. But after playing a game without it, I realized he needs it to keep my rate of fire up there. Also at 60" the missiles are the longest range weapon I have access to, while the Lascannons and Autocannons of other dreads are 48". This will help keep him out of trouble, unless something speedy gets to my back field, or someone deep strikes something on him. 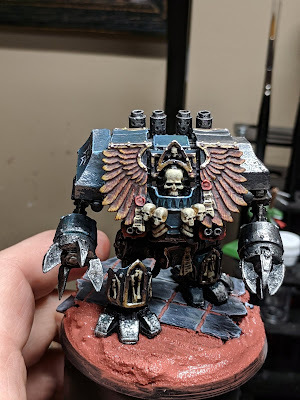 At fist I wasn't sure how to do the Deathwatch paint scheme. But once I added the missile pod I realized that I could paint the left pod shroud and lascannon silver. It works like a charm! For his chapter, I went with the Raptors. According to what I can find in the lore, the Raptors are ranged combat specialists and that seems befitting to a model with the longest range in the list. This year I am going all out for my display board for the Warhammer 40k Friendly. I figure that if I'm only bringing 8 models, the board should be really nice. 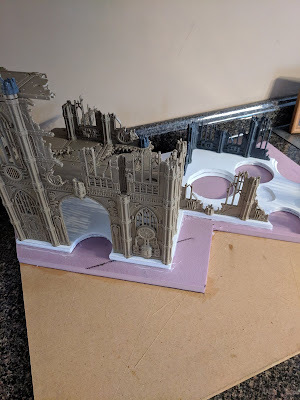 As a result, I picked up the Kill Team box set and used all the terrain in it to build a blasted out cathedral. The cathedral itself is on a raised platform, and the models in and around it will be sunk into the board. The interior of the ruin is pock marked with craters, as will the exterior. As of right now, this is where I stand. I picked up some spray foam to help make the transition from the foam board to the mdf, and soon I'll be figuring out the final placement of the models standing outside of the ruin. That's all for now though. This board and the accompanying models are proving to be a great project. I can't wait to see how it turns out.